More than a decade ago, representatives and leadership of organized professional hunting in South Africa condemned the practice of shooting canned lions in the country and they were in good company with practically all associations and clubs in Africa and around the world in agreement. We reported quite frequently on “canned shooting” issues and, when researching the subject, I found in African Indaba Volume 4 #5 (September 2006, page 9), the article “The Shooting of Captive Bred Lions” – the subtitle reading “PHASA (Professional Hunters Association of South Africa) Policy Statement issued May 2006”. One phrase from this Statement deserves to be mentioned “…. 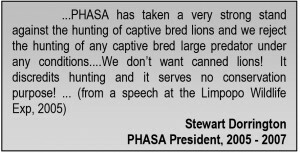 any member who may be involved in the shooting of captive bred lions is requested to refrain from such activities or resign (his/her) membership of PHASA. Furthermore, PHASA is going public with this stance. A letter will be sent out to the media…”. 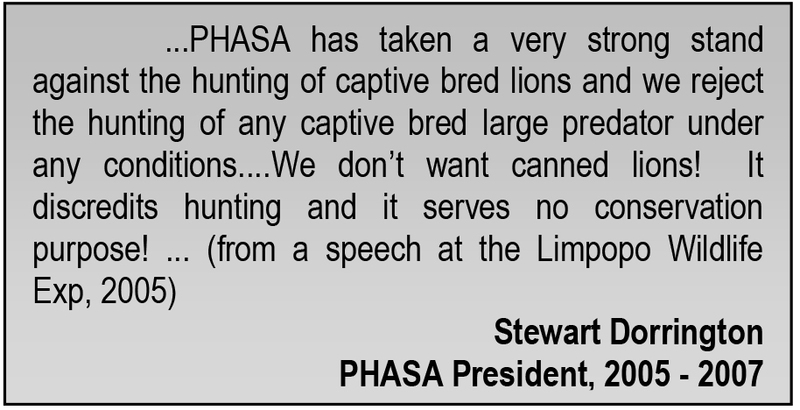 Reference was made to a PHASA Policy Statement of 1999, which reads under point 1 that “PHASA hereby states categorically and unequivocally that it does not consider the practice of “canned lion shooting” to be a form of hunting” and under point 4 that “PHASA deems an animal to be canned, when that animal cannot sustain itself, breed freely and be hunted under the principles of fair chase”. Now we heard that PHASA has made an about turn and adopted the position of the South African Predator Breeders’ Association (SAPA, www.sapredators.co.za) on this matter without alteration (African Indaba has a copy of the PHASA document dated 20.11.2013). What used to be canned lion shooting is now called “Hunting of Captive Bred Lions”. Sounds better, doesn’t it? But it still remains the same old thing. It reminds me of the old Grouch Marx statement, “Of course I have principles. But if you don’t like these, I have others!” Something like this must have been on the mind of those who elected to embrace the money-making machine of canned lion shooting as old school outfitters and professional hunters were apparently steamrollered by the vast majority of PHASA members who adopted the SAPA policy on lions. In this regard, we shouldn’t forget the political support for this position by some of the Conservation/ Environmental departments in South Africa’s nine provinces. We often hear that the canned lion industry only exists because there is a high demand to shoot these poor beasts but you can probably also reverse this argument, at least to certain extent, if you look at the advertisements for lion “hunts” on the internet, which usually portrays a South African lion “hunt” as a breath-taking adventure. Another argument claims that “the hunting [sic] of captive bred lions assists the conservation of wild lions by reducing hunting pressure on them”. Well, there is indeed a high demand for hunting a lion in the African wilderness. But lion hunting and their annual quotas are tightly regulated and controlled in all range countries which allow lion hunting. The quotas in these countries will always find eager hunters willing to pay the high prices for the privilege of hunting a wild lion; even if the chances of harvesting a mature male lion are 50/50 at best and not a few hunters go home empty-handed. This category of hunters will continue to hunt wild African lions and thus contribute to lion conservation in more than one way. This cannot be said of the other type of “hunter” who opts for the “guaranteed” shooting of canned South African lions. Their money goes to the lion breeder and the professional hunter and not a cent finds its way into lion conservation. It is a well-established fact that this kind of lion breeding has no conservation value. If the argument of reduced hunting pressure on wild individuals by hunting captive bred animals has any validity, the question must be asked why do we not then hunt captive-bred large carnivores like grizzlies in North America or brown bears in Eurasia?